London: Michael Joseph LTD., 1991. This is the first United Kingdom (England) hardback edition of The Joe Leaphorn Mysteries, and was published in 1991 by Michael Joseph LTD. in London, England. Michael Joseph LTD. is an imprint of Penguin Books, a major publishing house in England, which prints highly commercial popular fiction. 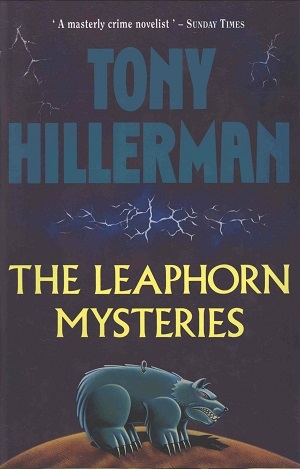 The Joe Leaphorn Mysteries is an anthology of the first three novels from Tony Hillerman's Navajo Mystery Series. This anthology includes: The Blessing Way (1970), Dance Hall of the Dead, (1973), and Listening Woman (1978). The jacket illustration was created by Kevin Hauff and features a ferocious looking bear fetish pendant sitting atop of a brown rise. The background is a deep purple and lightning bounds the title and author on the jacket cover. Format: Hardback, 24 x 15.9 m.
Binding: Dark blue boards with the author, title, and publisher's logo printed in gold on the spine.